Distinguishing Characteristics African-American male. Black hair, brown eyes. Brown's front teeth are chipped. His nickname is Boo. 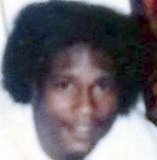 Brown was last seen leaving his mother's mobile home on Reams Drive in west Mobile, Alabama on February 15, 2002. He has never been heard from again. He was close to his mother and used to visit her home nearly every day, but he stopped going so often in the months prior to his disappearance. His mother stated he became withdrawn and sullen around that time. A few months before he vanished, Brown was arrested on three charges of robbery. It was the first time he'd gotten into serious trouble with the law. He maintained his innocence in the robberies, saying he'd been framed. He disappeared not long after he bailed out of jail. He had warrants out for his arrest when he went missing, but the warrants have since been withdrawn. There have been many rumors about Brown's supposed murder, but investigators haven't been able to verify any of them. They believe he is deceased, and foul play is suspected in his case, but it remains unsolved. Updated 5 times since October 12, 2004. Last updated March 21, 2018; picture added.